In the wake of the recent weather-related disasters, I imagine that I am not the only one who has asked themselves the question: “what would I grab from my house if I had a limited time to get out?” Suddenly, all the stuff that seemed so danged important is no longer even considered. First, of course, ensure the safety of loved ones and, perhaps second, gather important papers and files. But then what? What are the items that are irreplaceable; the objects that have little dollar value, but are personally cherished and woven deeply into the tapestries of our lives? Stacked within easy reach by the side of my bed are several five-year diaries that I would grab without hesitation. One is a daily account of my father’s life from 1941 through 1945. Two others – penned mostly by my mother – date from 1946 through 1950, and from 1951 through 1955. Another is mostly blank, but has some entries my mother made in 1958 (I think after that, raising three young children made keeping a daily dairy too challenging). The oldest diary offers a glimpse into my father’s life as a single young man: his proud purchase of a new Plymouth “special, deluxe coupe” complete with “air horns and power shift” (all for $812); his ambivalent feelings about the upcoming war and his probable involvement; receiving his draft notice; news of the bombing of Pearl Harbor; and then his eventual enlistment into the army. My favorite entries are the ones he wrote about meeting “a swell gal” at an All Women’s Voluntary Services dance (who, of course, turned out to be my mother), proposing to her only three months later (“Everything swell until I realized what I was saying” and “State of shock through day”), then – just two weeks after that – hopping a bus to Las Vegas to get married on Valentine’s Day. My mother took over most of the diary duties during the next five years as she chronicled their post-war life: going back to college, looking for work, spending time with friends and family, and traveling around the country. Finally, they landed in Southern California, where my father found full-time employment with the school system (where he worked until he retired), and my mother was hired as a writer and editor with a local defense company. Judging from the number of entries that itemize the cost of food and other purchases, it was obvious that the early years were a bit of a struggle financially as they built their life together. During the next five years, my parents started their family. My brothers were born during this time and many of the entries are about raising two little boys. I didn’t come along until the last diary and play a rather minor role since I was quite young. I pick up these diaries from time-to-time and choose a random spot to start reading. From the yellowed pages, I can hear my parents’ voices, read about their adventures, and get a sense of their devotion to each other and their family. Their writings help me understand a bit more about who they were and – by extension – how my brothers and I came to be the people we are. My big regret is that I didn’t read these diaries while my parents were still alive and could have answered the many questions I have. Unfortunately, that opportunity is gone, but I’m grateful to have these cherished diaries that chronicle their journey together and help to reveal the loving, funny, and complicated people my parents were. Thank you to the Cherished Blogfest team for once again hosting this delightful opportunity to share what we cherish with others. Link on over to the CBF site and check out the many inspiring stories you will find there. And, there is still time to create your own – the Blogfest has been extended through Sunday, October 22. Please join in! This post was written for the Cherished Blogfest 2015, which is taking place July 24, 25, and 26. Each participant is to write about one of their most cherished objects. After considering writing about my cherished husband, health, and friends, I decided they weren’t really “objects.” What I chose instead is a both an object and an entree to adventures. I have in my possession, a magical and powerful document. Held within its dark blue covers is my key to foreign lands and infinite experiences. It gives me the ability to not only travel freely around the world, but to return to the United States with few questions or concerns. 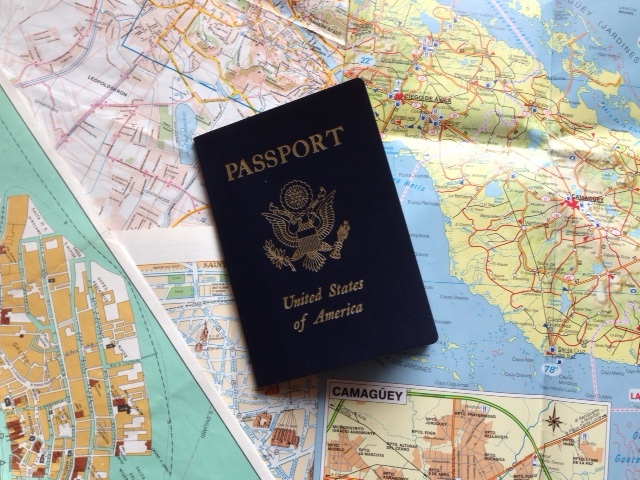 Although certainly not unique – after all, there are close to 150 million U.S. passports in circulation – my passport allows me to visit 174 counties, many of them without the additional requirement of a visa. The ease with which my passport allows me to travel from one country to the next is almost unparalleled. In fact, United States citizens’ travel freedom is ranked first, along with Germany, Sweden, the United Kingdom, and Finland. My passport has taken me throughout Europe and it has accompanied me across our northern and southern borders into Canada and Mexico. Most recently, it traveled with me to Cuba. I’ve only had to present it when I’ve entered and departed each country, but having it in my possession along the way has given me a greater sense of comfort and safety. The United States is not perfect and I know that we could do many (many) things better, but I also feel very lucky to be a citizen. The happenstance of my birth has offered me privileges that many people born elsewhere don’t have. My U.S. passport represents the strength of my nation and the relationships it has built over the decades with most other governments. Despite all of its power, my cherished document is lacking something very important which I hope to resolve over the next several years: there far too few entry stamps. My husband and I are looking forward to years of adventures in our retirement and I hope that, over time, those pages will be filled with dozens of stamps as we travel the world. To read more posts by Cherished Blogfest participants, please link to this page to visit other most cherished blogs.